Images and Icons are now one of the essential element of android application. With the new Material design more icons are used then text. But they are compressed and well created so it won't get stretched in any screen size devices. But at run time there are number of applications from where user can upload images, during this process image cropping and compression is required (must). because user may upload large file and it may take long to upload. and if network connectivity is weak your app may crash due to an error. That will create bad impact on user. So developers(you) has to take proper measures because even image compression and upload task increase load on mobile's ram and processor also. Apps like facebook, whatsApp, Google plus and many well known app does the same thing. so how they do and what is the proper way of doing it and even make it optimized. Go through these tutorial and you will notice different in timing and size. Create an activity where user can pic image (can take new image or can chose from gallery). in this tutorial it is TakeImageDemo. now put below layout code in xml file. I have used simple layout for this tutorial but you can create as you want. 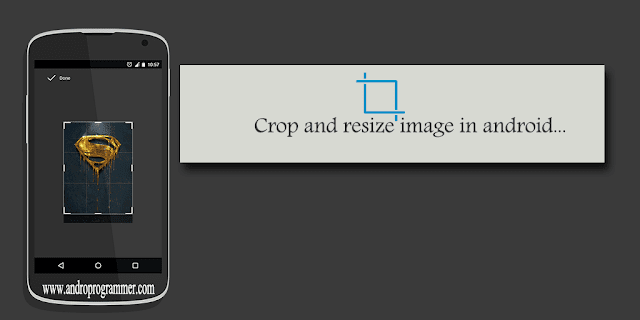 As you can see i am calling crop method from both the case when user take using camera or select image from gallery. one more thing you have to note that if user take new image using camera i am deleting that original file and just storing cropped image so it won't create space issue. It is best practice that first you resize image and then compress it so it won't get stretched.